Adventures in a Crafting Life: Rainbow Quilt DONE! It's done it's done, my rainbow quilt is done! I am so pleased with how this has turned out! It's a bit wrinkly at the moment as I left it in the tumble dryer slightly long and the creases set, but they'll come out next time it gets washed (which, given it's my son's quilt I'm sure won't be long). I quilted it in zig-zags, and have bound it in scraps of the green, blue, indigo and violet fabric. This was going to be one of his Christmas presents, but I've already got him a few other presents and he's too little to really understand the idea of Christmas anyway, so I've decided to give it to him early. I think a few games of hide and seek and a bit of tent building will be the order of the day! Linking up to Crazymomquilts, Confessions of a Fabric Addict, Freedom Fridays and TGIFF. It's so pretty! Going to make a great quilt fort! It's beautiful! I'm sure he will love it for years to come! 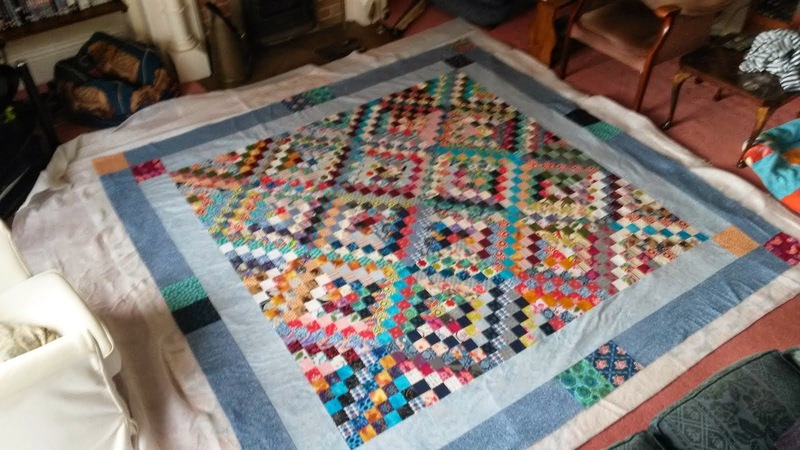 Very nice - love the design and the quilting! Whoop whoop!! Thanks :) I love that feeling of finishing a successful project! I love rainbow quilts. This looks awesome. And I agree quilts are made to be used and loved. Such a cheerful fort! Thank you, it is certainly being put to good use already! What a beautiful design! The colors are so bright; I agree he will love it for years!